An exclusive guide to help women in their career journey with choices, control and confidence. By sharing my story, and specific actionable takeaways for women in business, I hope that people who read my story will continue their career journey with choices, control and confidence. Joanne Flynn, Managing Director and Founder of Phoenix Strategic Performance, recently co-authored the book, “The Female Factor: A Confidence Guide for Women.” Her 3-part chapter of the book entitled, “Spanning Generations as We Journey Ahead,” focuses on the issues of women in the workforce over the past 50 years, looking at what has changed, what has not, and what women can do to move their careers forward. The second section is a call to action for women in the workforce. It focuses on the “Fundamentals for the 2020’s: Career, Choices, Confidence and Control.” The call to action is for women to take control of their careers, manage their choices, and have the confidence to leap off glass ledges and break through glass ceilings. Women must be organizationally savvy and skilled to proactively take charge of their own careers from the moment they enter the workforce. The third section is a personal experience, “Seizing Control and Leaping from the Glass Ledge.” This story chronicles one woman’s career journey that went from waiting, hoping and relying on others, to managing and controlling her own career. She created her own corporate ladder designed to avoid glass ledges while staying relevant, decisive, tough and committed to her career and herself. 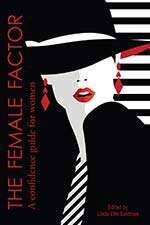 This book, The Female Factor: A Confidence Guide for Women, is designed for women internationally to embrace their unique qualities such as: empathy, compassion, genuine leadership, listening skills, collaboration, and communication. The purpose is to provide women with the information they need to feel confident in both their professional and personal roles. Other co-authors of this book include: coaches, consultants, psychologists, educators, and business leaders. A strategic, business-focused human capital advisory firm bringing an integrated business discipline to human capital performance. This is accomplished through: data and business analytics filtered at multiple levels; strategic insights into your most important asset, your people; and future-focused workforce planning & development capabilities.